If you are looking for something “Haunting do this Halloween Season, then check out Strike A Lot Lanes in Poteau. They have a Haunting good deal. Haunted Laser Tag open for the month October on Wednesday, Thursday, Friday and Saturday. Actors and Special Effects from 8pm until 11pm Weds, Thursday and Friday. $8.00 Standard entry fee with special effects. $10.00 when actors are present. 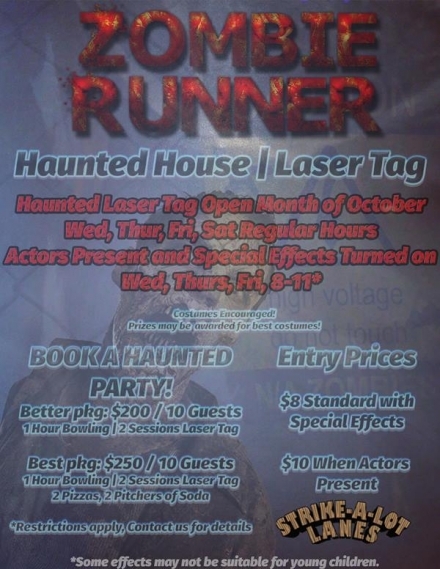 If you want to book a Haunted Party how about $200 for ten Guest and one hour of bowling and two sessions of Laser tag. $250 gets you - One hour of bowling two session of Laser Tag, two Pizzas and two pitchers of soda for 10 people. Strike A Lot Lanes is located at 1914 N Broadway in Poteau.